Good Morning! First off, THANK YOU for all of your sweet comments last week. With the events unfolding here in Houston, I decided to take the week off from blogging. Every few days I would check in on the blog and loved reading all of your messages. The Texas Gulf coast is slowly entering recovery mode. Some areas are still experiencing flooding as the water flows through rivers and bayous to head off into the Gulf of Mexico. Texas has a long road of recovery ahead of us. It has been wonderful seeing people drop everything to go help friends and strangers repair homes. I decided to ease back into sharing outfits on the blog this week. I love this little space of mine. The break was necessary, but I’m ready to get back to it. I’m starting off with this cute little work outfit. 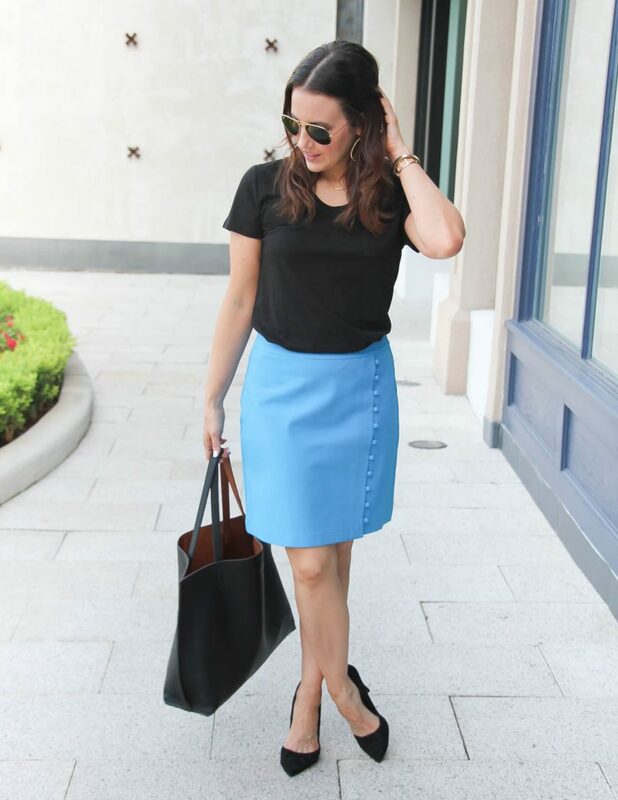 A few weeks ago, I headed into Loft during one of their 40% off sales and found this gorgeous blue button pencil skirt. I was drawn to the color and loved the button details. 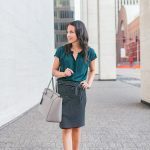 It’s a wrap skirt design, and perfect for the office. Sizing Note: I’m wearing the petite. Ya’ll Loft might be my new favorite place for soft and cozy tees that are not super see through. I purchased this gray tank earlier this summer. I’ve loved wearing it so much that I decided to buy the tee version in black. Because a black tee is the perfect year round basic. 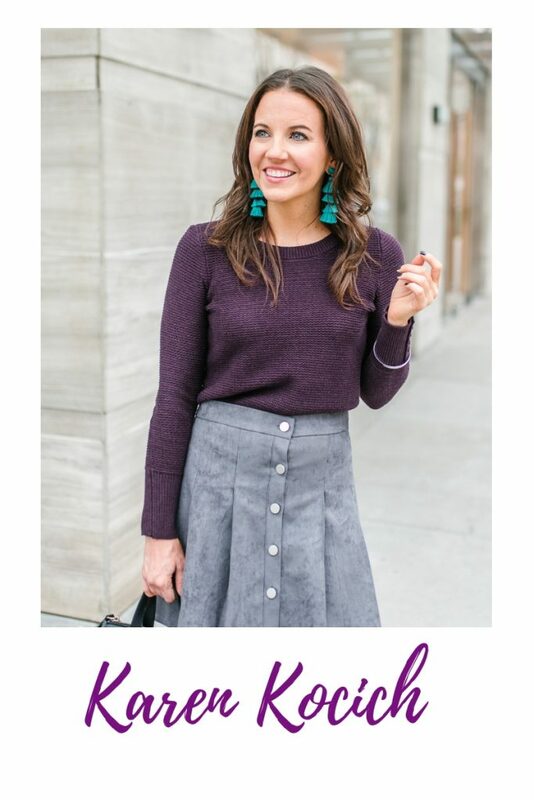 It’s the perfect compliment to this skirt for a cute work wear outfit. I have also paired it with white shorts (as seen here) for a more casual look. It’s also Style File Link Up day, so scroll on down for more outfit inspiration. Thanks for stopping by! That skirt is AMAZING!!! Thanks for linking up with us! So glad to hear you’re safe and sound. I love that skirt and the button details! Love this skirt! The button detail and color are wonderful. What a cute work look! Loving that little skirt on you! I love the colour and design of the skirt. The button detail is very elegant. Karen, this is a great classic professional look for warmer weather days. 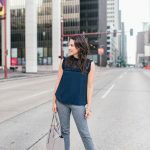 I’m a huge fan of Loft and I’ve also found their tees to be very versatile as well as comfortable and flattering. Glad to see you back in action and thanks for the link up. I am glad you are safe and I totally understand taking a blogging break. Fashion blogging is a fun and awesome challenge, but at the end of the day it’s not the most important thing in the world. Keeping you and everyone in Texas and Louisiana in my thoughts lately. Welcome back! Glad you are feeling ready to get back into blogging. The button details on that skirt are so cute! I am in love with this pencil skirt! The color and button details are so pretty. It’s a wonderful work look for sure. So glad you are back and thanks for the link up!